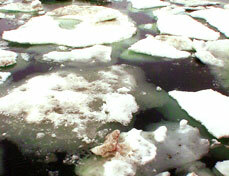 a significant increase in freshwater flowing into the Arctic Ocean is heightening concern about climate change. A team of Russian and us scientists has found that Siberia's Lena river, the world's ninth largest watershed, empties 10 per cent more water into the Arctic than it did 60 years ago. This may disrupt several vital ocean currents, which depend on differences not only in temperature but also in salinity. Freshwater addition changes the salinity and can thus affect the currents, such as the thermohaline circulation, which have a bearing on global climate. The finding followed an analysis of records of precipitation, snow depth and runoff in Lena's catchment that is spread over more than a million sq km along its 4,400 km length. The scientists, led by Jessie Cherry of the University of Alaska in Fairbanks, also found that the average winter snow depth in Lena's catchment has doubled to 44 centimetres from 22 centimetres in 1940. The findings were presented at the annual meeting of the European Geosciences Union in Vienna in the first week of April, according to a news report on the website of Nature . Meanwhile, a study by Mark Serreze of the University of Colorado, usa, found that the Arctic ice pack has reached a record minimum. The ice pack has shrunk from 7.75 million sq km in the mid-1970s to 5.2 million sq km. More than 1.3 million sq km of ice disappeared last summer alone, according to Serreze.